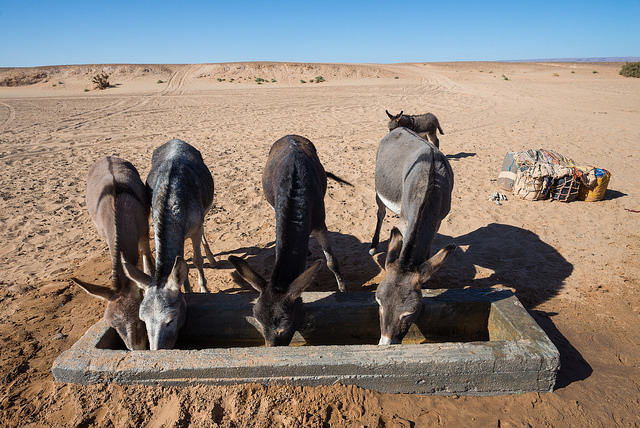 Morning departure from Ouarzazate to the Dades gorges and Todra gorges, passing the oasis of Skoura, where numerous ancient kasbahs, stand amongst the palm trees. 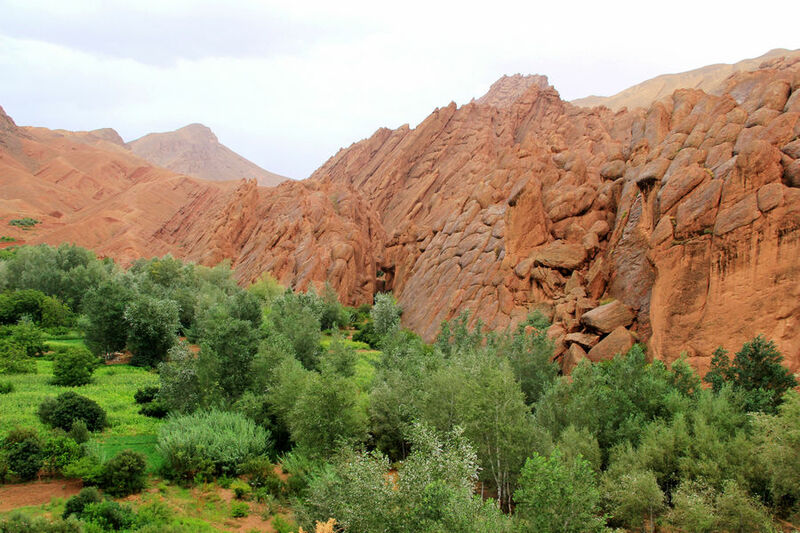 From here, our route takes us through Kela’a M’gouna, the valley of the roses, where we stop to have a Berber tea. Later, we drive off-road along the road of a thousand kasbahs to the Dades gorges for lunch. After lunch there is time for a hike around Dades gorges .night in hotel. After breakfast, we go off-road to N’Qob, passing the Tizi-n-Tazzazert Mountain in the Saghro mountain range to the village of N’Qob for lunch. From here our route takes us to the Draa valley at Tansikht in the afternoon, continuing south along the Draa valley till we reach Zagora. 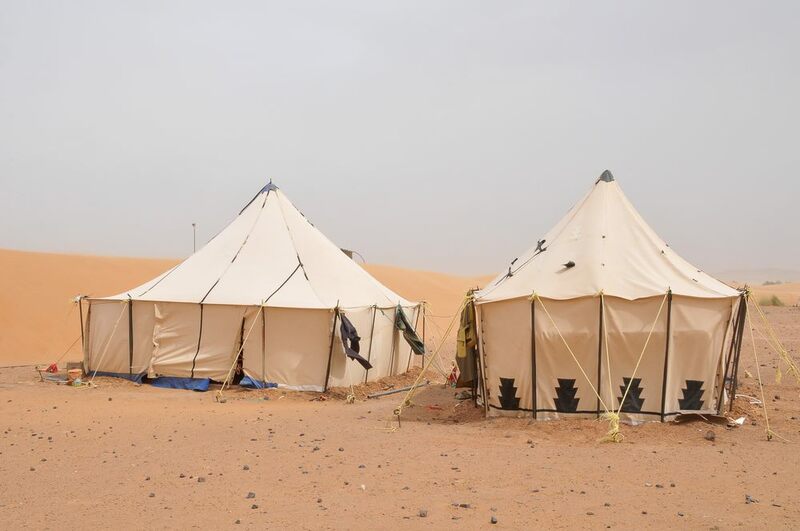 Here, the dunes of Nakhila await you for a camel ride, dinner and the night in a bivouac of nomad tents. 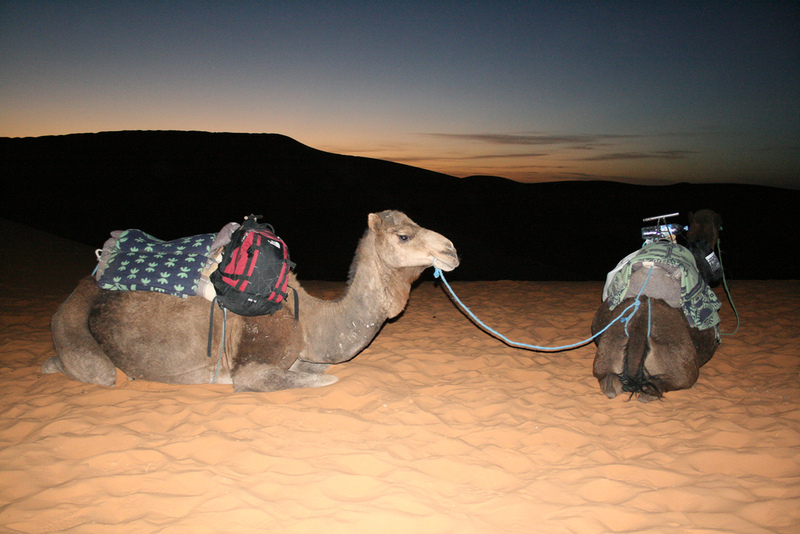 The return to Zagora is on camel back and, after visiting Tamegroute, we drive south to M’hamid for lunch. 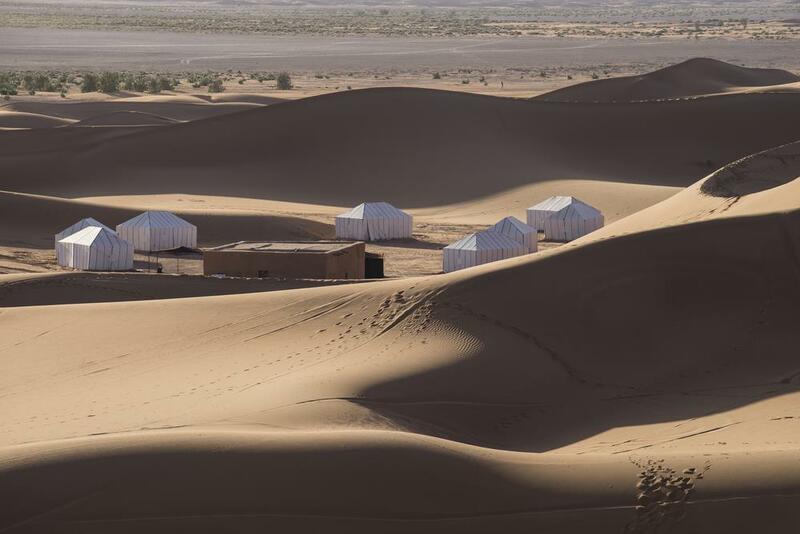 In the afternoon we make our way across another 60km through the varying features of the desert; ‘erg’, ‘reg’, ‘hammada’, oases, to the Erg Chagaga which, at 300m high and 45km long, are the largest in Morocco. These dunes afford a wonderful view of the setting sun, before returning to the campsite for dinner and a night’s rest. After breakfast, the road crosses another 100km of off-road driving in the Moroccan sahara desert, passing lake Iriqui and the mountains as well as fossils, for enthusiasts. The first village beyond the desert, Foum Zguid, is the place for lunch. The return to the Draa valley takes us through Taznakht, famous for its carpet shops, and back to the Dra’a valley at Agdez for dinner and the night in a hotel. Day 5: Agdez_ kasbah of Ait Ben Haddou_ Ouarzazate. 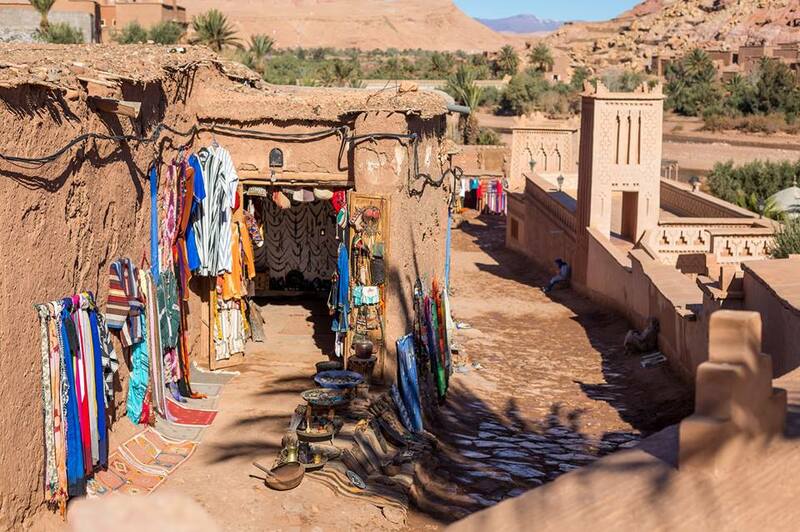 After breakfast, there will be a visit to the kasbah of Tamnougalte before returning to Ouarzazate, via the Anti-Atlas and the mountain pass of Tizi-n-Tinfifte (1660m). Once in Ouarzazate, we visit the kasbah of Tifoultoute, originally the residence of the Pasha of Marrakech and a symbol of the feudal period of the lords of Atlas. Afterwards, an unpaved track to the oasis of Fint nestling among the mountains, which once served as the crossroads of caravans, provides a hidden delight. After lunch, we visit the kasbah of Ait Ben Haddou. The return to Ouarzazate will complete the trip at the end of the afternoon. 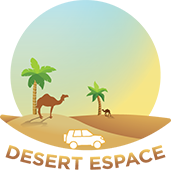 This tour can begins anyplace in Ouarzazate whether it is Airplane terminal, or any other transportation you use to get to your destination where you are staying in Ouarzazate. Full the form below and we will send you details about everything as quickly as possible.